I've mentioned before that I met a bunch of wonderful people at the Waterslide/PopKid show that happened while I was in Tokyo. One of the people I met was one of the guys in the band 2 Sick Worry (they played the show). He was also in the band Plum and on top of that, does a record label called Urban Sleep Discs. In addition to playing a great show with his band, he also gave me a few CDs from his label. 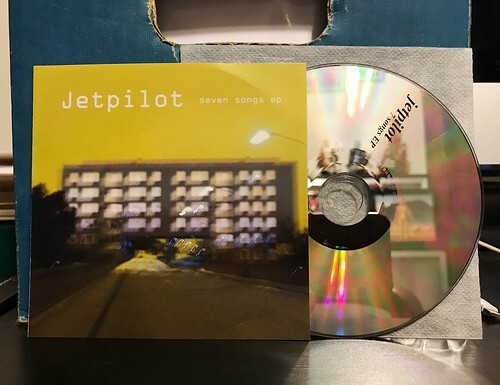 One of the CDs I got was this Jetpilot EP. Jetpilot being from Sweden immediately got my attention. There were so many amazing Swedish popcore bands in the late 90's, but it's a scene I haven't stayed as in touch with as I wish I did. Had I stayed alert, I probably would have heard Jetpilot long before now as they are right up my alley. They're more straightforward than a band like Starmarket, but they inhabit the same space. Big on warm, distorted guitar and strained, but earnest vocals. Some may call it emotional, but to me it's just another unique strain of pop music. In particular, the opening song "Worst Reminder" bursts out of the gate and really sets the pace for the duration of the EP. The guitars start off explosive, fade back a bit into some lead work for the verse and then come charging back in full force for the chorus. It's a formula that's tried and true because when it's done right, there's no better sound to my ears. Digging around the internet, it doesn't appear that Jetpilot is still together, but between this and a split CD I was also given (review of that coming soon), I've been made a huge fan of the band. It again makes me wonder if there are other amazing bands in Sweden that I'm missing. If you know of any, send them my way.